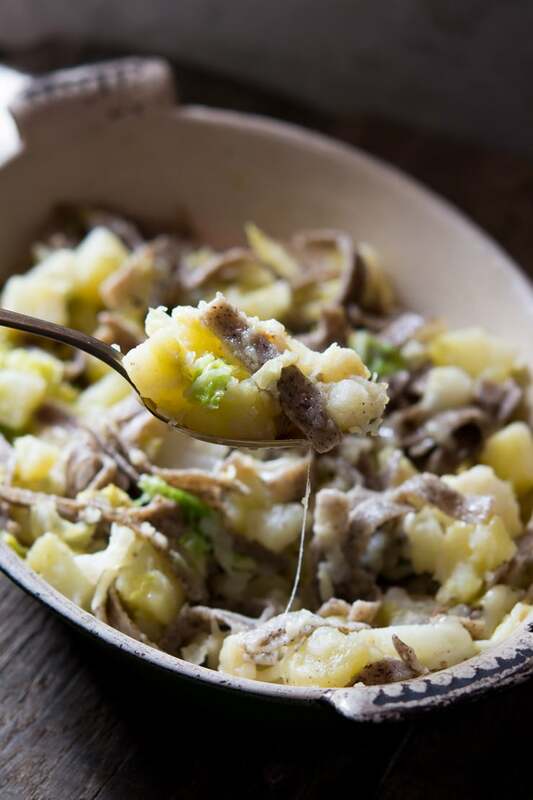 This northern comfort food dish is made with pizzoccheri pasta, potatoes and cabbage and is tossed with melted butter and fontina cheese. It’s a hearty, filling and incredibly delicious meal all made in one pot! 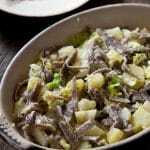 Pizzoccheri is a short, flat buckwheat pasta made with a mix of buckwheat flour and wheat flour. 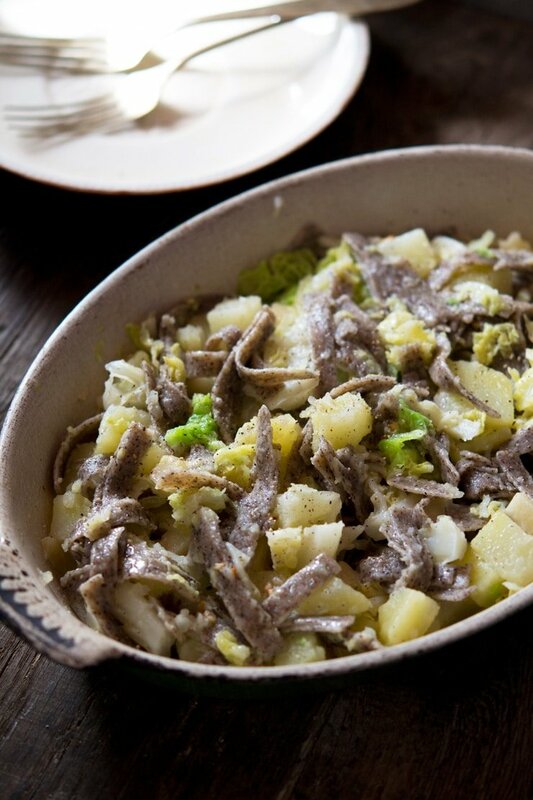 It’s most commonly found in this dish called Pizzoccheri della Valtellina which is buckwheat pasta, potatoes and cabbage mixed with butter and cheese. It’s a very easy recipe and whenever I make this is it gone in seconds, plates licked clean and all. You should be able to find pizzoccheri pasta in an Italian speciality food store although if you can’t find it then you could use any type of short buckwheat or wholegrain pasta instead. Ok can we talk about the cheese and butter for a second? I mean omg fontina cheese is one of the best melting cheeses ever. It oozes perfectly whilst not loosing any flavour, it’s strong and delicious. When the pasta and veggies have been drained and still hot the fontina cheese is sprinkled over the top THEN comes the garlic butter. Why is garlic butter one of the best things on this earth? It’s just so incredibly delicious and it’s poured all over this pasta dish. Mix it all together and you have yourself a large pot of comfort food heaven. Pasta, potatoes, cabbage covered in melted cheese and garlicy goodness. 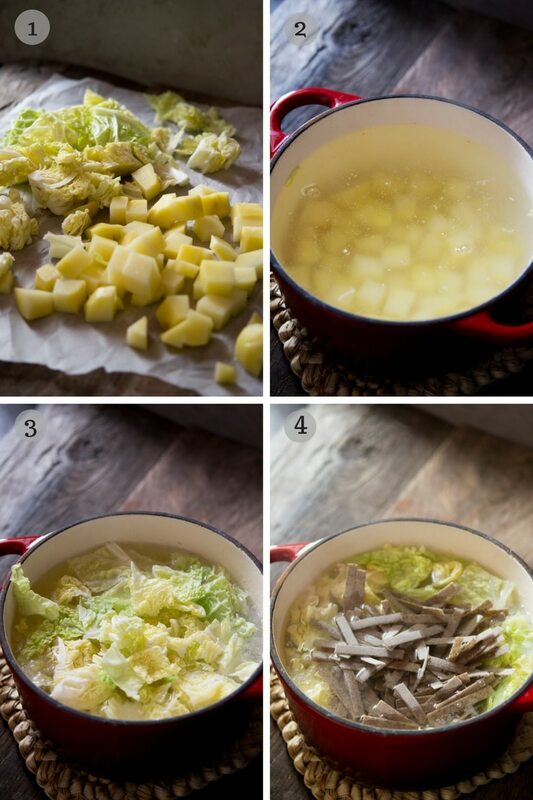 (1) First, peel and chop the potatoes into medium sized cubes and roughly chop the cabbage. (2) Add the potatoes to salted boiling water, bring the water back up to a boil and cook the potatoes for 2 minutes before adding the cabbage and pasta. (4) Boil the potatoes, cabbage and pasta for around 10 minutes. Meanwhile, finely chop the garlic and add that to a pan with butter and a little oil. Fry the garlic in the melted butter for 1-2 minutes, don’t let it brown, set aside. Drain the pasta and veg then add it back into the pot. Sprinkle over the grated fontina cheese and melted butter and mix it all together until the cheese has melted and the garlic butter has coated all the pasta and veg. Season with an extra pinch of salt and pepper and serve. I told you, it’s comfort food heaven right? I love that this is another “poor man’s” recipe using low-cost ingredients yet is filling and tasty (my favourite kinda food). If you’ve tried this pizzoccheri pasta recipe or any other recipe on the blog then don’t forget to rate the recipe and let me know how you got on in the comments below, I love hearing from you! You can also FOLLOW ME on FACEBOOK, TWITTER, INSTAGRAM and PINTEREST to see more delicious food and what I’m getting up to. This northern comfort food dish is made with pizzoccheri pasta, potatoes and cabbage and is tossed with melted butter and fontina cheese. It's a hearty, filling and incredibly delicious meal all made in one pot! Bring a large pot of salted water to a boil. Peel and chop the potatoes into medium sized cubes and roughly chop the cabbage. Add the potatoes to the boiling water, bring the water back up to a boil and cook the potatoes for 2 minutes. Add the cabbage and pasta to the pot and boil for 10 minutes. Meanwhile, finely chop the garlic and add that to a small pan with butter and olive oil. Fry the garlic in the melted butter for 1-2 minutes, don't let it brown, set aside. Drain the pasta and veg then add it back into the pot. Sprinkle over the grated fontina cheese and melted butter and mix it all together until the cheese has melted and the garlic butter has coated all the pasta and veg. Season with an extra pinch of salt and pepper and serve hot. That looks heavenly Emily, very healthy and comforting! Although I live 10 minutes away from Italy, I’ve never seen pizzoccheri pasta, probably because I wasn’t looking for it. Next time I will check for it and will try your recipe. Thanks so much Patty, let me know if you do! I’ve never been able to get hold of Fontina cheese but this looks sooooo delicious and comforting! Gruyere would be a great alternative if you can’t get fontina. Thanks so much Amanda! 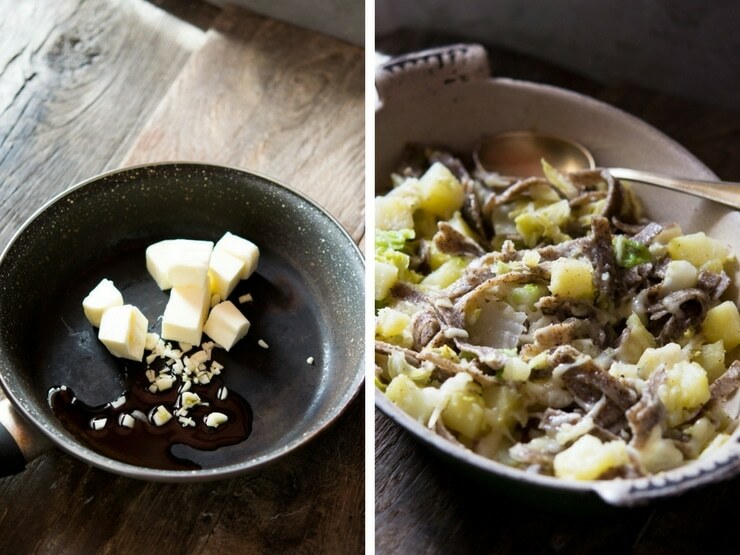 Cabbage, potato and cheese… I must be in comfort food heaven for sure. Thank you Bintu, it’s one of my favourite winter dishes. Yum! This definitely does look like a wonderful comfort food. I have never tried Pizzoccheri. Will need to seek it out now. Hopefully you can get ahold of it but if not you can use any short buckwheat pasta or even make it from scratch! I have to look for pizzoccheri pasta. Looks really impressive in this dish. I absolutely love the Fall flavours, the cabbage and potatoes… have to make this for my family. Thanks so much Natalie, it’s so easy too! Total comfort food – YUM!!!! Loving this tasty recipe! I’ve never seen pizzoccheri pasta in a grocery store but my grandmother makes similar, just uses plain flour instead of buckwheat/wholewheat :). It’s so easy to make by hand and worth the extra effort too!